Dubai is offering thrill-seekers a new way to see its dazzling skyscrapers. It’s offering an exciting ride on one of the world's longest zip lines. The 170 meter-high (558 foot) XLine opens this week in Dubai's Marina neighborhood. For an entire kilometer (3,280 feet), those brave enough can whiz past some of Marina's tallest skyscrapers. They soar at a speed of 50 miles/hour. A similar zip line opened two years ago near the world's tallest skyscraper in Dubai. The new zip line, however, is double the length and offers couples the chance to experience the thrill together with two zip lines. These run adjacent to one another. Dubai unveils a new zip line among the towering skyscrapers. It offers a ride on the worlds largest zip line. It is a cool way to see the cities many sky scrapers. The new zip line in Dubai is a thrill-seeker's dram. Those who are courageous enough to go on the ride can zip by at up to 50 miles per hour! All you need is some courage, $180, and a trip to Dubai. This article is about how skyscrapers in Dubai have been installed with zip lines. It is 170 meters high and is 3280 feet long. Those brave enough to go on to the zip line will have a breathtaking experience. This story is about a new zip line that attached to skyline's. People now have the chance to zoom across the sky. Dubai is offering thrill-seekers a new way to see its dazzling skyscrapers. It’s offering an exciting ride on one of the world's longest zip lines. It is 170 meter-high (558 foot) XLine opens this week in Dubai's Marina neighborhood. It soars at a speed of 50 miles/hour. This article is about how Dubai unveils a new zip line among towering skyscrapers. These new zip-lines will offer an exciting way to see its dazzling skyscrapers. This zip-line called the XLine is 170 meters high and soar at a speed of 50 miles/hour. XLine starts at the top of Marina's towers and lands near the Marina Mall. Tickets for the XLine cost around $180 a person. 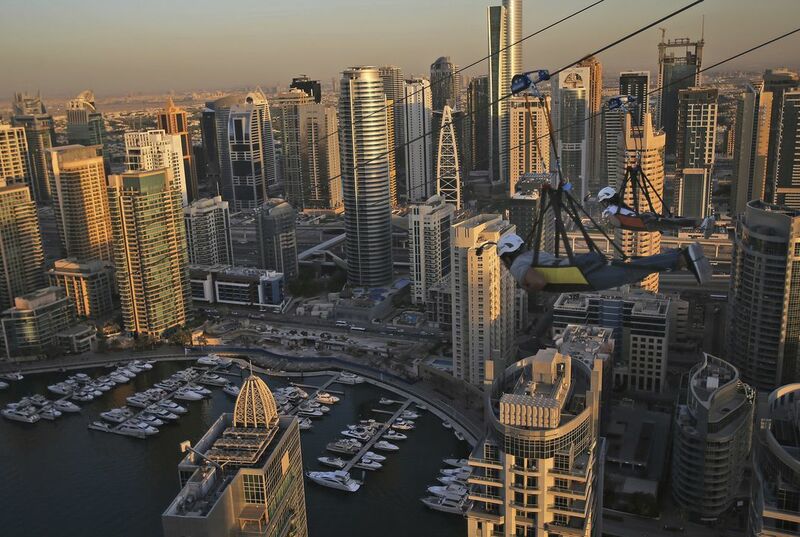 Dubai has a new zipline. It's called the XLine. The special thing about it is how high above the ground it is. It's 170 meters, or 558 feet above ground. It'll open later this week in Dubai's Marina neighborhood.